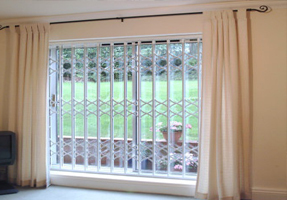 As Security is an increasing concern, along with our high security double glazed products, we also offer made to measure supplied and fitted security grilles. 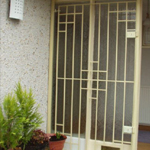 Collapsible gates are normally the preferred option for both commercial and domestic premises. Normally installed internally collapsible gates offer a strong, yet visibly pleasing barrier with the main feature being the facility to open and close them. We often find this critical in circumstances where the window/door is considered as an emergency exit (fire escape) or the appearance of a grille is not always pleasant. 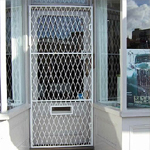 Generally used on commercial premises, heavyweight bar grilles offer an excellent visual and physical deterrent. Due to their heavyweight apperance they are usually installed externally. 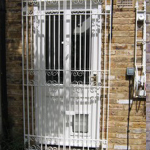 Heavyweight bar grilles are quite often specified by insurance companies and crime prevention officers. 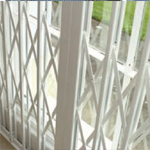 Lightweight Bar Grilles are generally suited for aesthetic purposes and are more habitable. 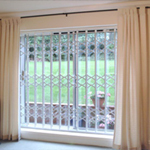 This is because the materials and the design are not as bulky as like the heavyweight bar grilles, therefore we recommend that they are fitted internally. Offering a similar strength and appearance to heavyweight bar grilles bar doors are commonly used in both domestic and commercial properties. Their purpose is to prevent unauthorized access to a specific area or as a primary barrier to an existing door. Available in different shapes and sizes mesh grilles are an economical solution to secure most commercial and domestic properties. 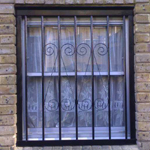 When installed internally mesh grilles offer a back up barrier should the glass of a window/door be smashed thus preventing a hand reaching objects or operating any locks or catches. When installed externally the mesh can provide a barrier to most objects being thrown at the glass for either vandalism or intruder purposes. Unfortunately this can sometimes restrict the maximum opening of a window.